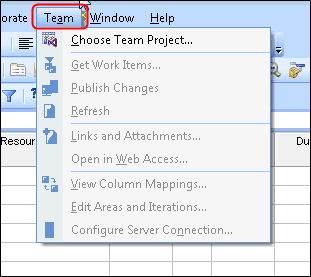 The Team Foundation Add-In was causing errors with a Project Server 2007 schedule. Project would get stuck checked out, user would receive save errors, and queue would stack up with stuck processes. This is because the Team Foundation Add-In that is part of Visual Studio 2012 appears to not be compatible with MS Project 2007 on Project Server 2007. When user attempted to Update project, Save, Publish, Close and Checkin, it would cause a series of stuck processes in the server queue per this screenshot. When the user would try to re-open the project, it would show in his cache as “checkin pending.” Sometimes the project would open properly anyway, but then he would receive errors when trying to save the project. It would cause another series of stuck processes in the server queue, sometimes with multiple groups of stuck items like the screenshot above stacked up in the queue. I cleared the server queue of all stuck processes. 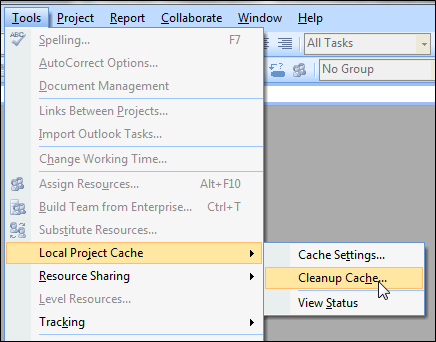 I logged into the user’s computer, started MS Project, and cleared their local cache. I then opened the project (this user is only managing one project). As it was opening, I noticed an unusual notification in the bottom status bar as it was opening stating something about ‘Checking for Team Project’ (I did not get a screenshot of that, unfortunately). "TF80069: Team Foundation encountered an error while updating data in the application." I tried re-opening the project, and checked the server queue, and confirmed that the original symptoms described above were happening. After clearing the queue, I opened the project on my machine and confirmed that I did NOT experience the same issue. This indicated that it was a machine-specific issue rather than a server or project file issue. After a quick web search, I found that the Team Foundation add-in was part of the Visual Studio 2012 package that the user had installed on their machine. I realized I needed to disable this add-in. 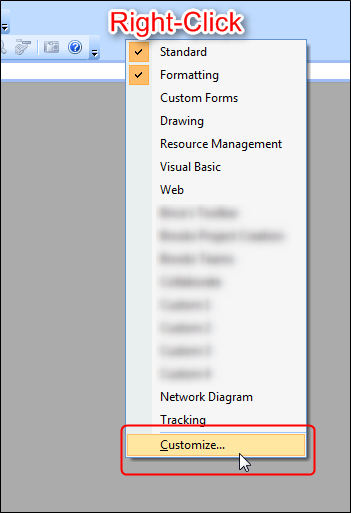 For MS Project 2007, the Add-ins manager is well hidden. To get it, you must add the COM Add-Ins button onto your toolbars. Right-click the toolbar area, and select Customize. 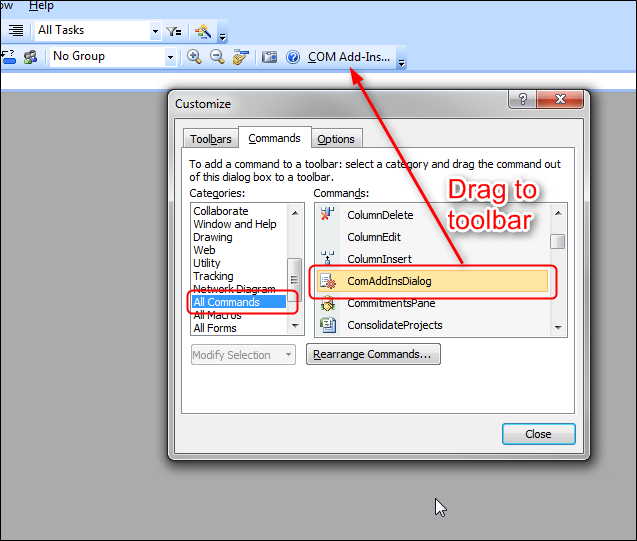 Click All Commands, then find the ComAddInsDialog command, and drag it to a toolbar. Click Close on the Customize Dialog. I would recommend closing and restarting MS Project. After doing this, the user’s MS Project behaved normally again, and the issue was solved.